The Congress Resource Centre Letterkenny is part of the National Congress Network established in 1980, to provide support resources and a wider range of services to the unemployed. Our services are provided with the aim of promoting social cohesion and justice so people can fully participate within the community. We have expanded our traditional role of providing services to jobseekers to now include everyone regardless of their circumstances. We can provide information and assistance on a confidential basis in your Social Welfare rights, queries and entitlements. We also provide job seeking support that includes education and training services in up-skilling and re-skilling, along with a support and referrals service. We are fully wheelchair accessible. The Centre is situated on the Pearse Road, Letterkenny and is a friendly and welcoming place where our staff deliver a professional non-judgemental service to all clients who come through our door. 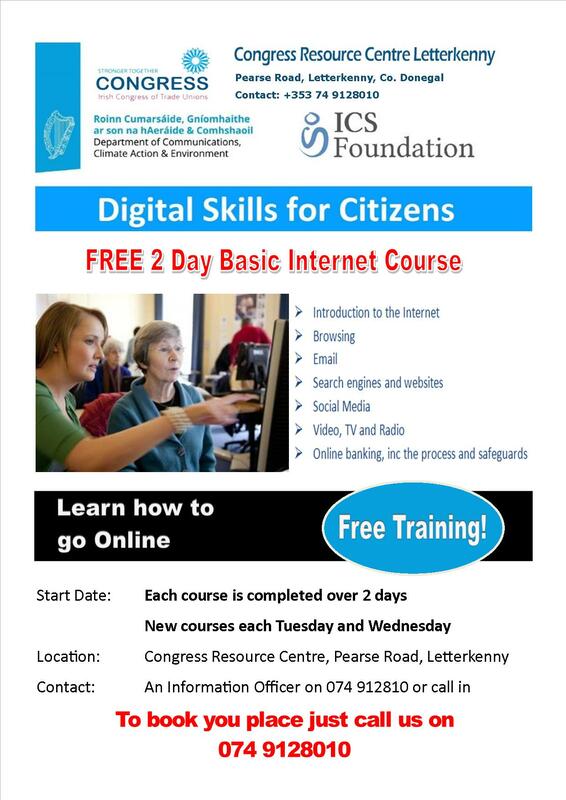 Introduction to the Internet, Browsing, Email, Search engines and websites, social media, Video and TV and Radio, Online Banking including the process and safeguarding. Will take place on a Tuesday and Wednesday.